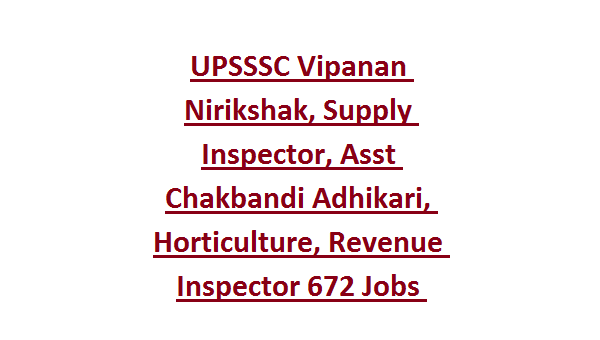 UPSSSC Vipanan Nirikshak, Supply Inspector Jobs Recruitment 2019: Uttar Pradesh SSSC invites online application form the suitable candidates who qualified degree or its equivalent for the available vacancies of Rajaswa Nirikshak, Purti Nirikshak, Marketing Inspector, Asst Horticulture Inspector, Assistant Chakbandi Adhikari, Executive Officer and District Information Officer Jobs. 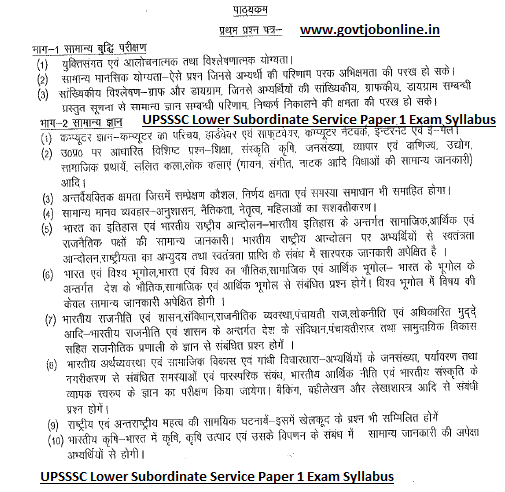 There are total 672 vacancies are in this UPSSSC Jobs Combined Subordinate Services recruitment 2019. Interested candidates can apply online for this UPSSSC Vipanan Nirikshak, Chakbandi Adhikari Jobs through upsssc.gov.in website from 31-01-2019 to 19-02-2019. 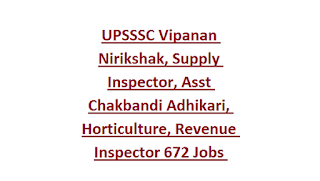 For more details regarding this UPSSSC Recruitment of Vipanan Nirikshak, Executive Officer, Assistant Horticulture Inspector, Asst Chakbandi Adhikari and Supply Inspector jobs exam pattern and Syllabus, selection process, qualifications and other information is given below. Age limits are applicable as on date 18-40 years for General candidates, 18-43 Years for OBC Candidates and 18-45 years for SC/ST candidates. For General, OBC candidates Rs.225/- and for SC/ST Rs.105/- and for others Rs.25/-. Candidates selection for this UPSSSC vacancies will be through Combined Competitive Exam 2019. Syllabus will be common topics of General Knowledge, Arithmetic & Reasoning, General Hindi, and General English. Detailed Exam Syllabus and pattern will be updated soon. Written exam will be conducted for 350 marks and consists of two papers. Paper 1 consists of 150 questions. Paper 2 consists of 25 questions.